Available in sizes S - 2XL and also comes in Gray with red graphic and Crew neck styles. 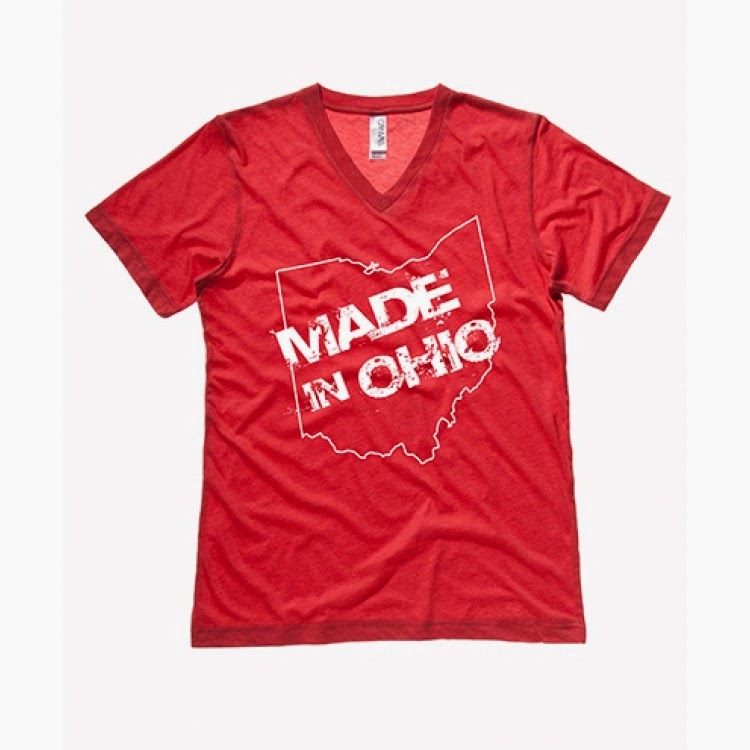 Whether you were born and raised here, or you're a lucky transplant from somewhere else....show your love and pride for the great state of Ohio with our V-neck MADE IN OHIO tee! Our Made In Ohio tee is a super soft light red tee featuring a state of Ohio silhouette and the phrase: MADE IN OHIO stamped across it Printed using environmentally friendly white water-based ink for a very soft feel, this tee retains its vibrant color and is able to withstand repeated washings. This tee has a unisex fit. This extremely soft tri-blend tee will quickly become one of your favorite shirts. The fabric is made of 50% polyester 25% cotton 25% rayon. Check out other Made in Ohio t-shirts for Youth, toddlers and Infants. The HAPPY CAMPER tee is a super soft, blue tee with a vibrant look and feel. Unisex fashion fit V-neck, in sizes Small, Medium, Large and Extra Large. Printed using white and red pastisol ink for a bright graphic, this tee retains its color even after multiple washings. This extremely soft tri-blend t-shirt will quickly become one of your favorite shirts. The fabric is made of 50% polyester 25% cotton 25% rayon. Empire state of shirt. Printed on our soft poly-blend slim-fit crew neck, for that well traveled feel. Want to design T-shirts? Learn how to use Illustrator. I saw one of my screen printers post a comment on FaceBook a while back venting his frustration of some file types that people would send him of their artwork. Went something like this. "A Word document is not an illustration file". That one gave me a good chuckle. But I doubt he was too upset since it was an opportunity to make a little extra coin charging an art fee. This is typically a charge that screen printers charge to "prep" your artwork if its not already done. The typical charges that I see for art services is around $40 an hour but that probably fluctuates depending on your location and skill level. When I started designing T-Shirts I watched a lot, and I mean a lot, of YouTube videos and tutorials on Adobe's website learning the ins and outs of Illustrator and designing Vector graphics in general. I have been using Photoshop and other pixel based image programs for years and I knew that I could create my designs using these programs. But I also knew that it would be more difficult to get things just right so I decided if I was going to be taken seriously and wanted to be a good designer I need to use the right tool. Illustrator is that right tool for me. To get you started here is a quick tut on knocking out shapes & text in your designs. This allows the color of the shirt to show through the design in areas where no ink will be applied. artists and t-shirt lovers can create, buy, and talk about art and t-shirts. Design By Humans was born in 2007 with the simple vision of bringing artists from around the globe together to give them a platform to produce wearable art that tells a story, strengthens humanity and inspires life through creativity and design. 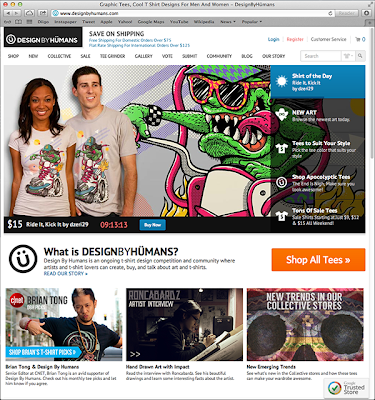 You will find hundreds of awesome t-shirt designs at Design By Humans in Men's, Women's and kid's in sizes Small through 2XLarge. Prices range from $15 - $25 and orders over $75 ship free in the US. 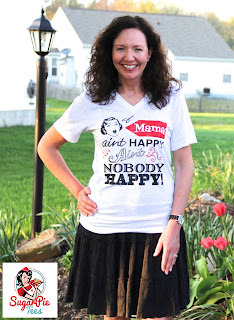 Here is another cheeky Tee from Sugar Pie Tees on White Fleck Tri-Blend with the oh so true phrase "If Mama ain't Happy, ain't nobody happy". At least I know that's how it is around my house. 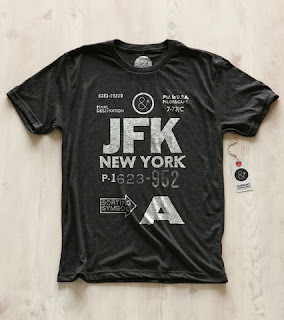 This T-shirt is printed on fabric made of 50% polyester, 25% cotton and 25% rayon for the softest feel possible. You can grab this tee from Sugar Pie Tees in a Unisex fit v-neck in Small - XLarge for $22 and it makes the perfect mothers day gift! Tee Splash is dedicated to the Art and Production of great tee shirts with a bit of the business side mixed in. We are t-shirt lovers and tee enthusiasts always looking for great t-shirts to write about and wear.